A lifelong fan blogging about the NHL's New York Islanders. I do have the express written consent of the New York Islanders to use their logo on this website. Well, a month into the season and here we are again. That feeling of, "What do they have to do to win a game?" is back. This is NOT the time to hit the big red panic button. The facts are the Isles started 3-1-0, but went 0-3-2 since then. In their last game, the Isles were on the wrong end of a tough call in OT, which might have cost them the game. Everyone seemed to know what happened, except for the guys in stripes. On a positive note from this game, oft injured goalie Rick DiPietro started, and played very well, allwoing 2 goals throughout regulation. 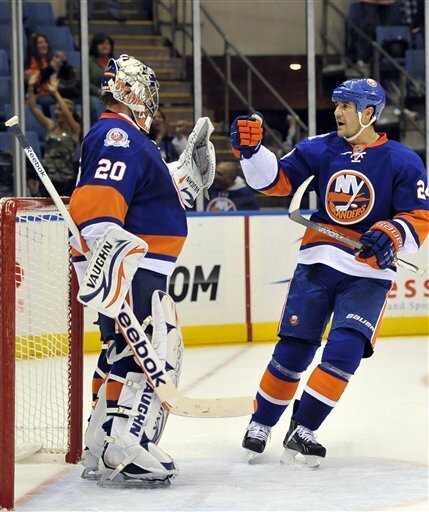 The Isles powerplay got 2 goals in the second period, and they peppered Thomas Greiss with 37 shots. Overall a great game, but just an unfortunate outcome. The Islanders have also yet to win a road game. Their best chance came in Pittsburgh last week when, after a rare Matt Martin goal, the Isles were up 2-0 in the third period. The Penguins came back and tied it against Evgeni Nabokov, who had been playing great. The game went to a shootout, and for some reason unknown at that point, Evgeni Nabokov simply left the game and Rick DiPietro came in for his first game action of the season. Even Isles announcer Howie Rose was baffled. He said, in complete shock, "What in the wide world of sports is going on here?!?!?" DiPietro played fine in the shootout, allowing a goal to Evgeni Malkin on a move that had DiPietro sliding before the puck left Malkin's stick. Unfortunately for him, the Isles couldn't match it. The bottom line is, the Isles are not playing badly, they are just not winning. Their penalty kill ins #8 in the league. The power play is #10 in the league, both solid numbers. If these numbers continue to stay the way they are, the Isles will be fine. There is no reason to panic. For the first time in 15 years, the Islanders host the Winnipeg Jets on Thursday, and that should make for a great game as last year the Islanders and the Atlanta Thrashers always played close, competative games. It's early, and eventually this will all work itself out. Well, here we are again, off to a fast start. 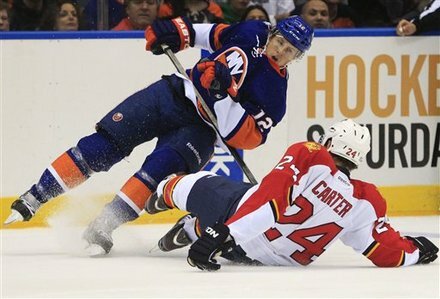 The season is in full swing, hockey is back, and the Isles have shown plenty of promise through the first 5 games. There has been a share of highs and a share of lows. Now let's take a look at some of the players and their impact on the Isles 3-2-0 start. Hopefully this is a sign of what things will be like the next few years on the Island. If he can continue at the pace he is at, then the sky is the limit for the former top draft pick. Mark Streit-The captain is back. 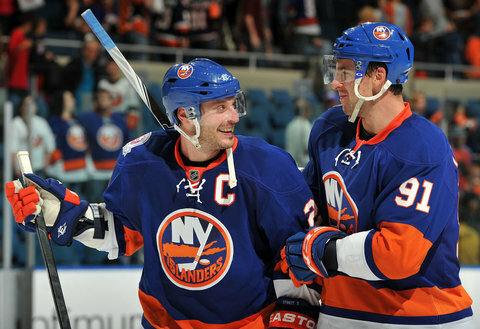 The Isles really missed their captain last year and his presence was felt quickly. In the game against Minnesota, Streit made a beautiful pass to set up a Frans Nielsen goal. He is the leader of the power-play and as you can see in the video above, he is responsible for most of the chances. He's completely healthy, and hopefully he will get back to the All-Star form he was at a few seasons ago. Welcome Back Mark Streit! 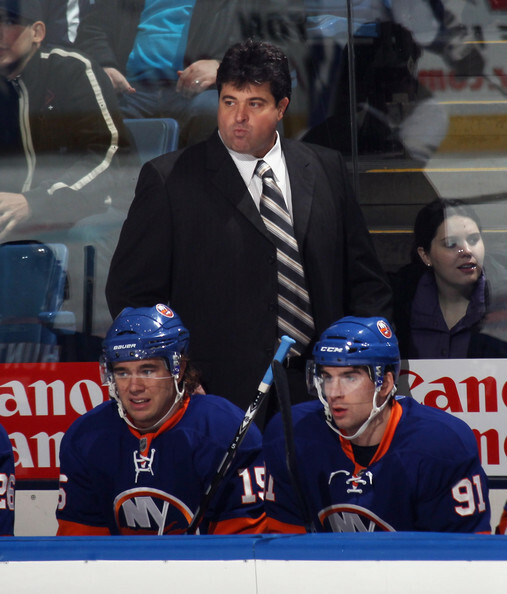 Jack Capuano's Gut- Apparently Jack Capuano knows something that we all don't. On opening night, he suprised everyone by naming Al Montoya starter. He stuck with the hot hand for the first 3 games, and Montoya allowed only 4 goals, winning 2 of his first 3 starts. Then, when everyone thought Montoya was going to get the start against his former club, his gut feeling changed. Was it what he ate for lunch, or was he on to something? Evgeni Nabokov, who hung up on Garth Snow, got the start and played like the Evgeni Nabokov from San Jose, stopping all but 2 Ranger shots and leading to an Islanders victory. The Entire Third Line-On paper, the third line of Josh Bailey centering Brian Rolston and Blake Comeau looked pretty good. But except for a couple Brian Rolston power-play assists, this line has been very ineffective. In fact, Comeau has been a healthy scratch the last two games to give Trevor Gillies time in the lineup. With goal scorer Comeau, veteran leader Rolston, and Bailey in the middle, this line better figure something out otherwise head coach Jack Capuano might need to jumble up some lines. 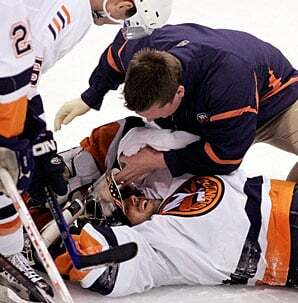 Rick DiPietro-I really hate to be mean like this, but I am really starting to become less of a Rick DiPietro fan. From a side note, the most productive thing Brian Rolston has done so far this season has hit DP in the mask with a shot during practice. This gave DP a concussion, and he has yet to play this season. Hopefully, his case can be like Sidney Crosby's, with many setbacks and problems. With Nabokov and Montoya healthy, why even waste time on DP? Only 5 games into the season, it isn't a lost cause yet, and there is still hope. Things are starting to get back to normal, especially since DP is injured again. My guess, Evegeni Nabokov starts tomorrow in Florida. But, with Jack Capuano's changing gut, you never know. Let's see how this goes. Will you go to as many games in Brooklyn as you did at Nassau Coliseum? (c) 2010 www.letsgoislanders.com. Awesome Inc. theme. Powered by Blogger.